We are proud to announce that three Morgan & Morgan offices received top tier rankings in the 2018 edition of “Best Law Firms” by U.S. News & World Report and Best Lawyers. 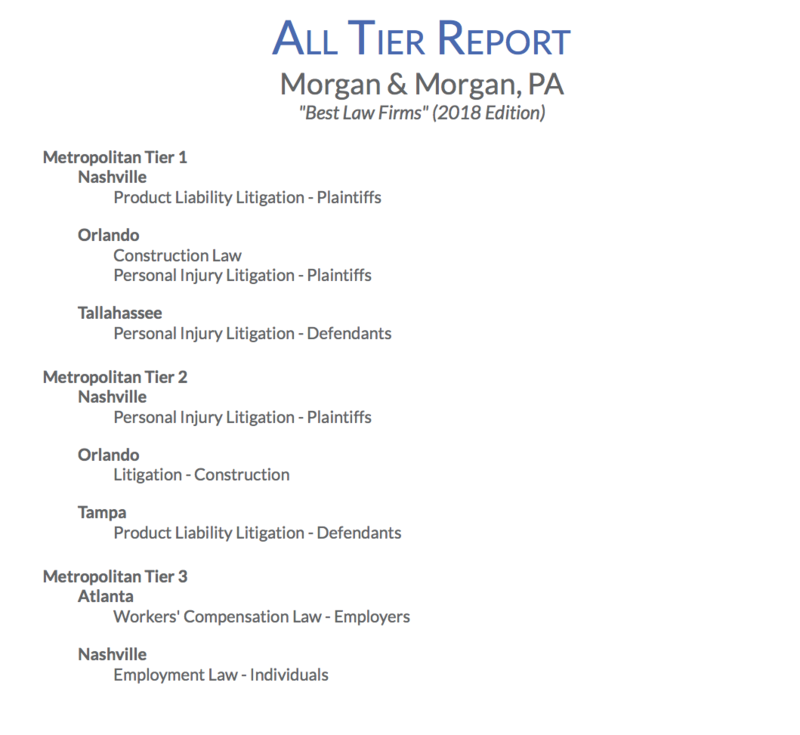 Our Orlando, Nashville, and Tallahassee offices received Top Tier Metropolitan ranking in the practice areas of Product Liability Litigation - Plaintiffs; Construction Law; and Personal Injury Litigation - Defendants. Our Tampa office was recognized in Tier 2 Metropolitan ranking for Product Liability Litigation, and our Atlanta office was ranked Tier 3 Metropolitan for Workers Compensation Law - Employers. This isn’t the first time we’ve been chosen for this honor. Morgan & Morgan ranked in both the 2016 and 2017 editions of “Best Law Firms,” making this year’s inclusion our third consecutive year of being recognized as a top tier law firm by U.S. News & World Report and Best Lawyers. Law firms selected for inclusion in the U.S. News & World Report and Best Lawyers “Best Law Firms” list must have a reputation for professional excellence among peers and consistent positive feedback and reviews from clients. Beyond having the esteem of clients and fellow attorneys, in order for a firm to be eligible for a “Best Law Firms” ranking, it must also have at least one lawyer included in The Best Lawyers in America ©. This is a distinct honor that recognizes the top four percent of practicing attorneys in the country. Lawyers featured in The Best Lawyers in America © are selected through an intensive peer review process, and they cannot vote for themselves or pay to be listed. 26 Morgan & Morgan attorneys were listed in The Best Lawyers in America © 2018, some of whom were veteran recipients featured in Best Lawyers ® lists for over 10 years. We at Morgan & Morgan are honored to be selected for 2018 edition of U.S. News & World Report and Best Lawyers “Best Law Firms” list, and we look forward to living up to our reputation by continuing to fight for the people, not the powerful.